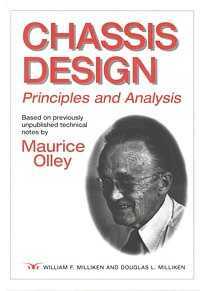 Published in February 2002, this 700 page book is based on previously unpublished technical notes by vehicle dynamics pioneer Maurice Olley. Upon retirement, in the early 1960's Olley wrote a series of monographs totalling over 500 pages. 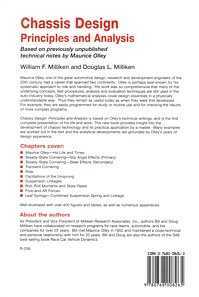 These monographs set forth the foundations of vehicle dynamics as experienced by Olley himself. His mathematics and explanations on oversteer/understeer, steering, ride, suspension design, oscillations of the unsprung masses, overall vehicle dynamics and many other topics are as valid today as when they were first written. Bill and Doug Milliken have rearranged Olley's monographs into a single book. Olley's original figures have been retouched and retained. The mathematics has been updated to match today's accepted symbols. Explanatory comments and derivations have been added where it was thought to be helpful. Additional material is contained in the appendices and the book begins with Olley's Reminiscences--the closest Maurice Olley came to writing an autobiography. At the SAE Automotive Dynamics and Stability Conference in Troy, Michigan, May 15, 2000, Bill Milliken told some stories about Maurice Olley. Our good friend (and contributor to "Chassis Design"), Tom Bundorf, has created this illustrated version of the talk from the video, using Bill's original lecture notes, scans from the video and from various Olley publications. At the same SAE Automotive Dynamics and Stability Conference, Tom Bundorf presented an overview of vehicle dynamics developments at General Motors during the period 1952-1980. Following the pioneering work of Olley and his associates, a new generation of engineers put this technology to use. Tom has created an illustrated version of his talk and kindly given us permission to post it here.